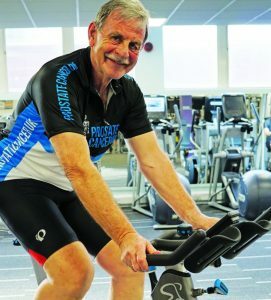 A PROSTATE cancer victim is urging people to join him in a 12-hour spinathon to raise money for research into the disease. Ian King had an aggressive form of the cancer diagnosed in June last year and opted for surgery as a cure. The spinathon takes place on Saturday 28 April at Anytime Fitness in Chertsey Road, Woking and not in August as incorrectly stated in the print edition.